My Problem: raising Year 13 University Entrance in Biology at Tamaki College. Further to that, students must be MOTIVATED to access their learning online. 2. Blogging during the learning of internal assessment content is like walking a tightrope. This statement from me caused great debate within a few of the 2016 Spark MIT teachers. I said that during internal assessments students blogged during the 'learning' stage; sharing what we had done in class, different activities they completed, any practicals that we did, etc. 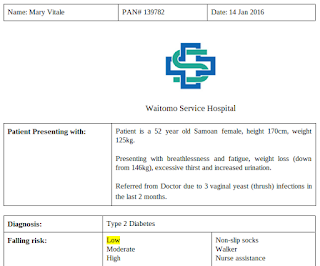 The example I gave was having students diagnose whether an imaginary patient had Type I or Type II diabetes and share their 'Doctors Chart' online. Students can't (on the other hand) share online any information they have analysed, synthesized, or extended from class learning or sources online. These understandings that each student has formed are their own. This distinction was made to minimize the risk of plagiarism, as well as meeting assessment conditions and authenticity requirements. Another teacher argued that her art class frequently post their emerging products online for peers to give each other feedback and help; and isn't this the nature of collaboration? I couldn't help but agree with her sentiment. However in Biology we assess the understanding of a concept that students are able to put into words and explain, analyse, or link, so to have access to another students' explanations would blur the lines of assessment as it currently stands. 1. I have been using Google Docs to create my visible planning that students can access. I had to explicitly show them that the column on the left is where their learning outcome is written, and the two columns on the right contain activities of different levels. I have used SOLO levels to differentiate the tasks. Potential challenge: I am unsure whether my class actually understands SOLO levels, or that they are set out to gradually build understanding of a concept. 2. I could also be using Google Calendar, or Hapara's new Workspaces on Teacher Dashboard to format my visible planning. Potential challenge: I should survey my class as to which format would be the easiest for them to navigate, and which one they would be most likely to access and use to catch up or revise. to describe where they could find my visible planning (all of them could). Only 1/4 of the students who had accessed it outside of class time had used it to catch up, despite every student in the class missing more than one lesson throughout the term. did they look at the learning outcomes for the unit? had they used it in another way? It worked for me because we have done an assessment similar to this one Yr 12. Youtube videos were more helpful than website. The topic was pretty interesting that I wanted to learn more about it. I like that the teacher was always there when I needed feedback or when I think I’m going off topic. The time wasn’t long enough for me to do it my research properly. Didn’t have enough understanding for the topic and what the structure for the assessment will be. Researching helps but not so much information about the homeostasis whole cycle. The time of the assessment was not a great, a lot of distraction was on at the time. Distracted from other assessment and other stuff. I went off topic most of the time because the topic was quite interesting i guess. So overall, the website and activities were not so useful (although, this is based off the small sample size of just one student) and perhaps I wasn't clear enough in explanations of content OR the assessment criteria. This is a rather large failing on my part; I thought we had spent plenty of time covering basic homeostasis and different homeostatic systems, but from this student's perspective perhaps I did not. I suspect that this student may have found youtube videos more useful during the writing of the assessment because the visible planning document provided links to class activities such as reading simple presentations and answering questions, completing interactive animations, making and placing SOLO hexagons to discuss links between concepts - rather than just providing information to use in the assessment. The activities were usually completed in class with teacher explanations occurring before, discussions between friends occurring during, and plenty of time for questions to be asked. Perhaps as a stand-alone document this format of visible planning is not as useful for the single solo learner trying to catch up on missed class time? However, it also can't simply provide links to resources for the assessment, as students require understanding before they can begin to understand and process resources online. What I would do again if I could? Definitely my time management because I thought it would be easy so I left it to the last minute to do it. Search for a lot of information on the internet to get more understanding about the topic. Take note when the teacher is explaining the topic. Another point to note from her feedback is around the clarity of assessments. We discussed this at Spark MIT again; isn't that exactly what we wanted when we were time-pressed at university? WHAT do I need to know to succeed? What do I have to DO? So I understand where she is coming from. We are within our boundaries to provide NCEA students with generalized marking schedules, as long as no exemplar judgment statements are included. So I have done that for their current internal, just as University students are providing with marking schedules for their assessments! 5. Random positive outcome: some students' blogs have been so clear and concise that they can act as resources for students who missed a lesson. Case in point - Sela quickly caught up on the idea of phototropism by reading Rita's blog, and was able to create her own within the same lesson! Find out what students need in the time that they're with me. Find out what they need if they're away and need to catch up. Find out what would motivate students to access the online tool - because success in NCEA may not be enough to overcome any barriers in formatting, clarity, lack of understandable resources etc! Will have to survey them after school so as not to remove them from more class time, and will probably provide food to tempt them to stay! Upgrade sites with marking schedules. Provide time in class to interact with assessment requirements; perhaps have time in class to make own schedules? Consider how to swap the format of online planning; back to websites with links and videos and explanations? But then I am explaining content and could potentially just be giving students answers on a plate! I find Milo works particularly well as a bribe to work! We use it frequently :-) I like what you are doing with your inquiry, it is interesting and I remember being in a similar position myself starting out, with no history of students having attained UE in my subject too. It was 5 years realistically to make that change of culture and it came from more than just my department and relationships were the most important factor i think on reflection. Good luck with term two, you are clearly doing a great job already. Thanks Rowena! After our meeting on Monday I feel like I haven't done anything very innovative just yet :S but perhaps the most simple solution is the best one; I agree with you about relationships. If you have them the kids seem to work really hard for you, just as much as for themselves and their success! I hope you didn't mind my shout-out about your art class :) I enjoyed our discussion.